Are you searching for multi fuel stoves in the Ripon area ? Ripon is the third smallest city in England. It is located 11 miles (18 km) south-west of Thirsk, 16 miles (26 km) south of Northallerton, 12 miles (19 km) north of Harrogate and 29 miles (46km) from the Leeds Stove Centre. Leeds Stove Centre, based in Pudsey, are becoming one of the leading suppliers and installers of multi fuel and wood burning stoves to the Ripon area. This is mainly because we offer a huge choice of stoves from a mass of manufacturers and distributors. We have stoves that range from modern steel multi fuel stoves to traditional stoves with tracery and cast iron doors. The stoves we provide are not intended to just look great in any home but also run efficiently. Many of our high quality multi fuel stoves are available to view in our newly extended showroom in Leeds, with some models being on ‘live’ display. Visiting our showroom will give you an insight into how a stove could like in your home and also the options available for the fireplace. At the Leeds Stove Centre we pride ourselves in supplying the highest standard of stoves that we believe are the best value for money. We supply stoves from leading manufactures such as Charnwood, Stovax, Morso and Esse but also from stove manufacturers that are less well known too! With a huge choice of brands available and a variety of styles and designs to select from, we are confident that you will find a stove suitable for your home. Our highly experienced HETAS registered stove installers can install your multi fuel stove and any flue system to the highest of standards ensuring full compliance with current regulations. All our installation teams are employed directly by ourselves. Please call us on 0113 255 5622 to answer any questions or queries that you may have or to book a free installation survey. 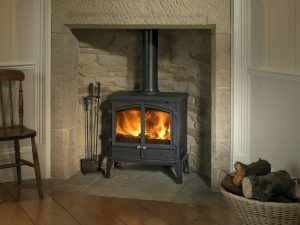 The Leeds Stove Centre – Your choice of supplier of stoves in the Ripon area.